Guided by the visionary Mr. B.C. Prasad, Group Chairman who pioneered the real estate development business at Whitefield, Bengaluru, Chaithanya creates living spaces that are not limited by walls. 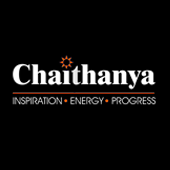 Beyond brick & mortar and other clichés lies the heart of a Chaithanya masterpiece. One that is crafted by the sure hands of an artist. The baton of leadership has changed hands to his son, Mr. Guru Prasad (MD), for whom God is in the details. Perfection has a deeper meaning for him than what is captured in lexicons. His innovative vision and global sensibilities guide the organization. To dedicate ourselves to passionately crafting unique living masterpieces as an ethical, progressive and socially sensitive organisation. To be recognised as India’s finest and most respected real estate company leveraging creativity and augmenting life to the fullest.